Much like last year, I had a good amount of cranberry sauce left over from our Thanksgiving meal. With last year’s leftovers I made a batch of cranberry white chocolate chip muffins that we totally loved. I wanted to make them again this year, but I also couldn’t shake the feeling that I wanted to experiment and try something new. And when it comes to baking experiments in my kitchen it’s go big or go home. 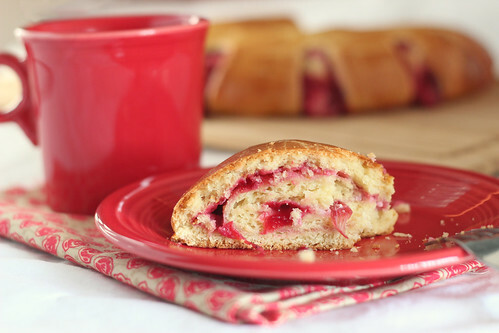 I settled on a fun “all day” sort of project, Yeasted Coffee Cake with Cranberry Cream Cheese Filling. My first attempt was delicious, but….. ugly. I rolled the dough a touch too thin, added a touch too much filling, and chose an odd shape that resulted in a whole lot of spillage. To be honest, I was pretty bummed. I had visions of gorgeous golden brown cake and what I had was a mound – of deliciousness, but still a mound. You know the saying, if at first you don’t succeed…. So I was back in the kitchen on Tuesday. There was still some spillage, but the overall cake was much more aesthetically pleasing. The only thing not pictured is a simple vanilla glaze. It was an after thought but really added a nice sweetness to the tart cranberries. I’ll include it in the recipe below and let you decide if you want to use it or not. Oh and one last thing, yes this can be somewhat time consuming, with the multiple risings and steps, but don’t let that scare you! Most of the time is just spent waiting! 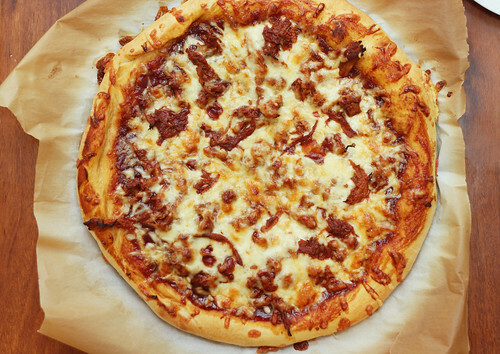 To me the most challenging part was shaping the dough, but that was also the most fun! *If your cranberry sauce is extra liquidy, drain of some of the excess liquid using a mesh sieve. In the bowl of a standing mixer, fitted with a paddle attachment, add the warm water and yeast. Stir to dissolve. Add the sugar, egg, vanilla, and milk and stir with the mixer on low speed. With the mixer still on low speed, add 1 1/2 cups flour and salt and mix for 1 minute. Increase speed to medium-low and add the butter, one piece at a time, until fully incorporated. 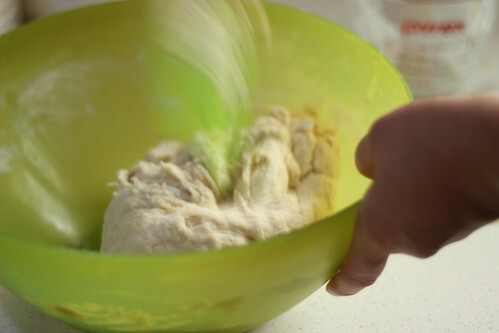 Change the attachment to the dough hook, taking the time to scrape down the sides of the bowl a little bit. Add the remaining flour and knead on medium-low speed for about 5 minutes. Increase the speed to medium and knead for 2 more minutes. While the dough is chilling, make cranberry sauce (if not using left overs) and cream cheese filling. To make the cream cheese filling, beat together the cream cheese, sugar, flour, and salt, until smooth. Add the egg, zest, and vanilla and beat until combined, scraping down the sides of the bowl as needed. Chill thoroughly before using. 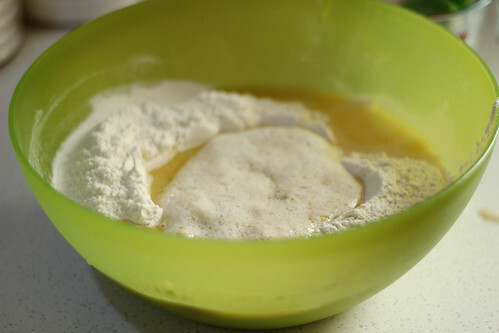 Remove the dough from the fridge and place on a lightly floured surface. 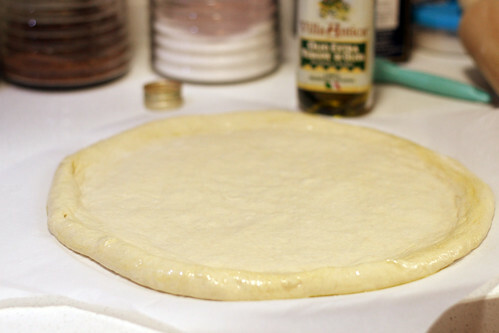 Pat into a rough rectangle then roll with a rolling pin into a 15 by 9 inch rectangle, about 1/4 inch thick. 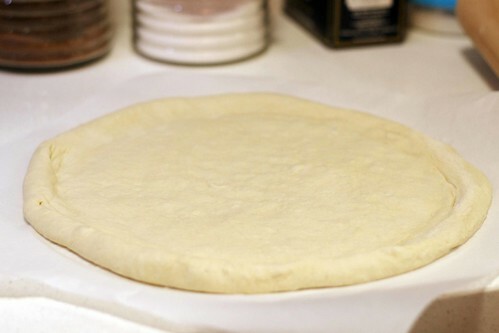 Use your hands or a dough scraper to straighten the edges of the dough. Spread cranberry sauce over surface of the dough, leaving about at least a 1/2 inch border around the edges. 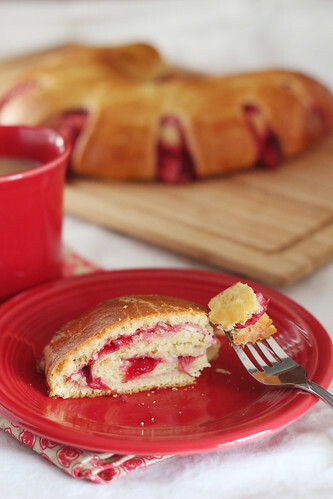 Over top of the cranberry, spread a layer of cream cheese filling. Preheat oven to 350 degrees. Brush dough with egg wash. Bake for 25-30 minutes or until the top is a nice golden brown. If it seems to be browning too much too fast, cover with foil halfway through baking. Transfer to a wire rack to cool. 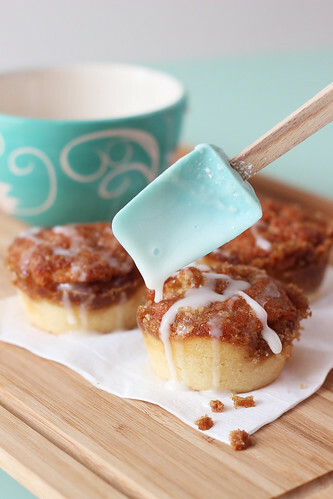 For the glaze, simply use a fork to mix together the powdered sugar, milk, and vanilla. Drizzle over the top of the cake before serving. *After proofing, the cake can be kept in the fridge overnight to be baked in the morning. When I was younger I used to love these prepackaged cinnamon roll muffin things. They might have even come in a low-fat version…. I can’t remember the brand name (maybe it’s Hostess? ), but man did I love those little devils. I can even recall coming across them in a vending machine and feeling like I had won the lottery. Nowadays, I prefer my sweet treats to have ingredients that I can pronounce, but I can still appreciate the idea behind my old favorites. A few weekends ago I lazily rolled out of bed well after 9 with a very strong craving for cinnamon rolls. Not wanting to wait hours for the whole process, I had to go on an internet search for something else to have with our eggs.Then I remembered something from my friend Josie’s blog. 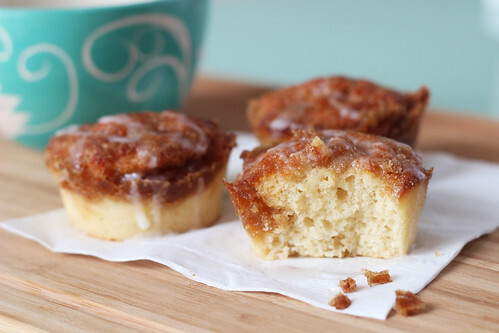 Sure enough, easy cinnamon roll muffins sounded perfect, and totally reminded me of the treats I used to eat. What I really like about these is how quickly they come together, you don’t even have to preheat the oven! I also like how they still have light yeasty taste to go along with the cinnamon sweetness. No, they are not a perfect replacement for real cinnamon rolls. But they are a still a great, quick, easy, sweet treat. *Some have felt that the yeast flavor was very strong. If you are worried about that, you can try reducing the amount to 3 tsp (1 Tbsp). I haven’t tried it personally, so I can’t stand behind it 100%, but I don’t think it would affect the rise too much. Lightly grease a 12-cup muffin tin. 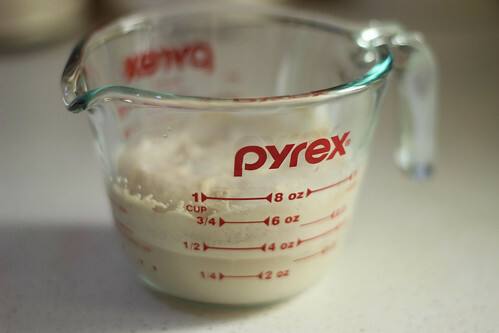 In a glass measuring cup, stir together the yeast and milk. While the yeast is dissolving, sift together the flour, sugar, and salt in to a large bowl. Pour the milk/yeast, vegetable oil, vanilla extract, and egg in to the bowl. Stir until smooth. Divide the batter evenly among the 12 cups. Set aside and allow to rest for 15 minutes. While you are waiting, add the ingredients for the filling to a small bowl and combine with a fork, until crumbly. Divide the filling evenly among the 12 cups and gently swirl into the dough with the fork. Place the muffin tin in a cold oven, then set the temperature for 350 degrees. Bake for 18-20 minutes or until a toothpick inserted in the middle comes out clean and centers spring back if lightly touched. While allowing the muffins to slightly cool, stir together the powdered sugar and milk until smooth. 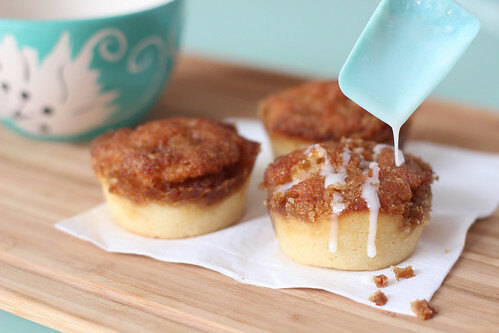 Drizzle over warm muffins and serve. These muffins taste best warm, so serve them immediately or reheat in the microwave for a few seconds. Brace yourself for incoming carbs!! Seriously, I was planning out my posts for the next few weeks and I realized I had 4 (maybe even 5!) bread recipes in the queue. Do I have a problem with carbs? Very good possibility! 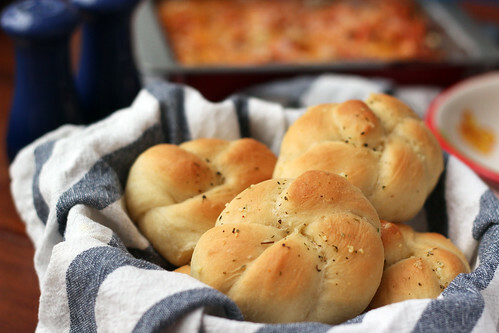 This particular bread/roll recipe is one that’s been a regular in my kitchen for probably 3 or 4 years now. I even had it posted on my old blog. The only reason it didn’t make the “Top 30(1)” import cut was because I hated the photo and I make them often enough that I knew I would eventually get a photo I was happier with. 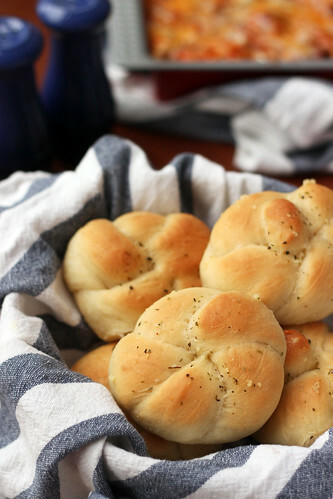 The time has finally come and I think you’re going to love these rolls just as much as I do! 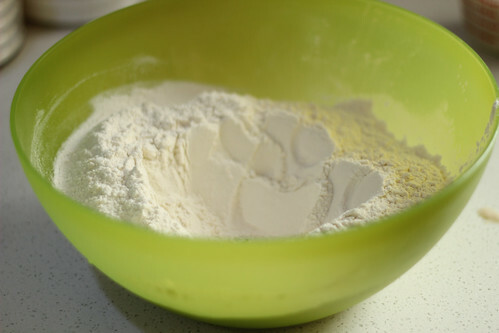 In a large bowl or a standing mixer fitted with a dough hook, whisk together the flour, sugar, instant yeast*, and salt. Pour in the milk, olive oil, and lukewarm water. Stir with a wooden spoon until it becomes too difficult then dump out on to a lightly floured counter. 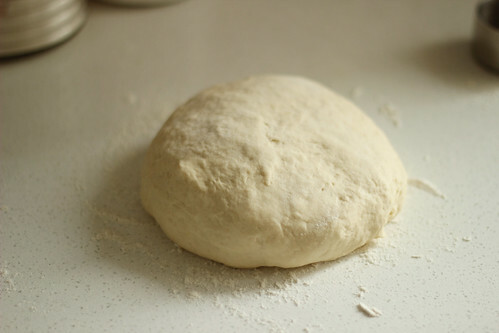 Knead with hands for about 8-10 minutes, or until the dough can be shaped into a smooth, elastic ball. 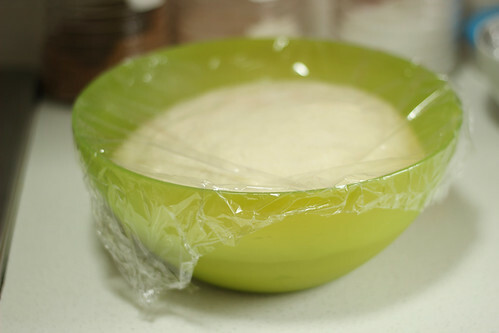 Or, knead with standing mixer on low for 5-6 minutes, or until the dough is smooth and elastic. 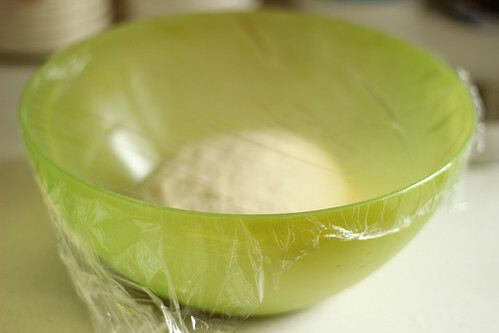 Transfer the dough to a lightly oiled bowl and cover with a clean dish towel. Place in a warm, draft free spot (like an off oven with the light on!) and allow to rise for about 1 hour, or until doubled in size. 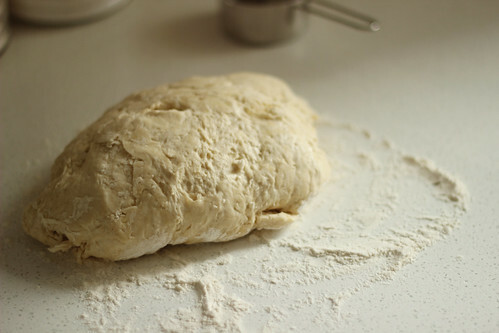 After the dough has risen, dump out on to a lightly floured surface. 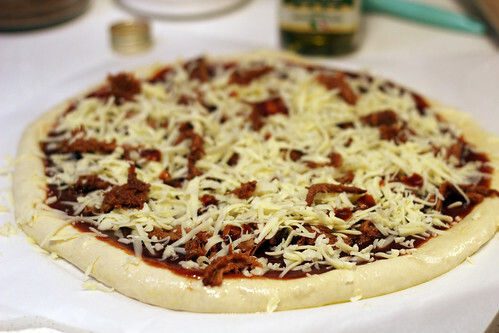 Divide the dough into 12 even portions. Roll each portion into a rope, about 10-inches long, then tie into a loose knot. Take the long pieces that are left after making the knot and tuck one in to the top of the knot and the other into the bottom of the knot (so everything is tucked in and neat). Place the knots on a lightly greased baking sheet and allow to rise for 45 minutes, or until very puffy. While the dough is rising, preheat oven to 350 degrees. Once risen, bake the knots for 15-18 minutes, or until they are starting to lightly brown. While the knots are baking, place the butter and garlic in a microwave proof dish and microwave until the butter has melted. After removing the rolls from the oven, brush with butter/garlic mixture. Sprinkle with Italian seasoning and/or Parmesan cheese, if desired. *If you do not use instant yeast, you will need to proof the yeast by stirring into the lukewarm water and letting sit until dissolved and foamy.